:: Tune in each week to WordSmitten's About the Books for fun and informative interviews with contemporary authors, editors, and educators. and spend the entire day writing. Skibell, who is putting the finishing touches on his third novel, traces his penchant for writing back to his teenage years when reading works by Edward Albee, Samuel Beckett, and John Steinbeck captured his interest. He began his literary career writing plays and screenplays, did not believe he had the temperament of a dramatist, and changed his focus to crafting novels. Along the way to settling into his niche as a novelist, Skibell tried his hand at other jobs including bread baker at the Mainstreet Bakery in Taos, New Mexico; copy editor for the Argonaut newspaper, Marina del Rey, California; screenwriter for the Bryna Company, Los Angeles; and, as a bartender at the Los Angeles Tennis Club. Born in Lubbock, Texas, Skibell grew up “steeped in pop music.” Conceding that music styles from the Beatles to Bob Dylan have been an influence on his writing career, Skibell noted that he is a real fan of Keith Jarrett. In fact, his first novel, A Blessing on the Moon, published in 1997, was inspired by the horrors of the Holocaust. His second novel, The English Disease, published in 2003, examines the life of Charles Belski, a fictitious Jewish character who is guilt ridden after marrying a gentile woman. Believing that the computer provides a sense of endlessness and a temptation to stray from the story line, when composing his works of fiction, Skibell writes everything out long hand. Only after the words are down on paper does he transfer them to a computer. When asked who his favorite author is and why, Skibell paused and then cautiously shared that during the past few years he has been immersing himself into the legendary parts of Talmud, an established record of rabbinic discussions pertaining to Jewish law, ethics, customs and history. “I guess my favorite writer is the little Jew who wrote the Talmud.” He compares the genius of the writers to Shakespeare, Sophocles and Tom Stoddard all rolled into one. Considering that the Talmud is a compilation of comical and tragic stories penned by many writers, Skibell's comment is enlightening. A recipient of a National Endowment for the Arts grant, Skibell received his undergraduate degree from the University of Texas at Austin and earned a Master of Fine Arts degree from the Texas Center of Writers, now known as the Michener Center for Writers. His first novel, A Blessing on the Moon, which was translated into several foreign languages including German, French and Dutch, won the Richard and Hinda Rosenthal Foundation Award from the American Academy of Arts and Letters, the Steven Turner Prize for First Fiction and the Jessed H. Jones Award for Best Book of Fiction from the Texas Institute of Letters. His writings have also appeared in The New York Times, Poets & Writers, Maggid and Tikkun. 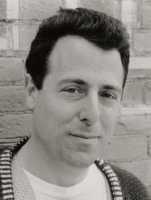 Currently an associate professor of English in the Creative Writing program at Emory University in Atlanta, GA, Skibell has also taught at the University of Wisconsin; the Humber School for Writers in Toronto, Ontario, Canada; the Taos Summer Writers Conference and Bar-Ilan University in Ramat Gan, Israel. 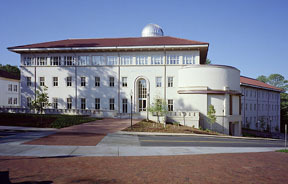 Spending his days writing and teaching at Emory University leaves Skibell with little time to enjoy leisure pursuits. However, if he did have “free time,” he would like to run and bike. When queried about how he deals with “writer’s block,” Skibell quipped, “I probably become hostile and aggressive to everyone around me.” To know how accurate this assessment is, one would have to confer with his wife Barbara or his 17-year-old daughter Arianna. Copyright ©2001- 2008 WordSmitten and wordsmitten.com All Rights Reserved.